Buckler-style Shields for 28mm miniatures. These are made of hard plastic and are sold unpainted. 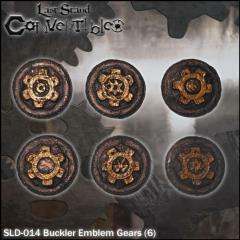 Buckler Shields are offered in small packs and army packs as well as several custom sets. Buckler Shields are made in two sizes: Small are 16mm in diameter; Large at 19mm in diameter.